Give your home the “impact statement” it wants to make this spring. It’s not difficult. Actually, it can be done just by adding a few potted plants in the right areas. For example, if you have a markedly unpretentious entryway, a few simple terra-cotta pots of geraniums, petunias or pansies would probably do it great justice. If you set them on a stairway, be sure to set them as close to the rail as possible to allow free passage. These same blooms can accentuate a pale, shingled wall on porch. 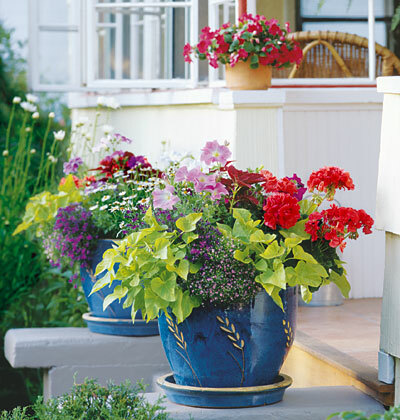 The porch would form the perfect backdrop for a few colorful ceramic pots. Given basic care, these trouble free performers will shine for you all summer long. What do you think about these simple yet effective gardening and decorating ideas? If you have any thoughts or ideas of your own, we’d love to hear them?